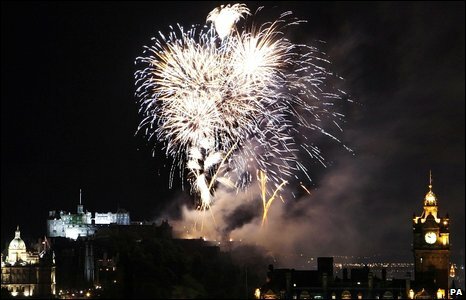 More than 200,000 people have gathered in Edinburgh to see the city's annual arts festival come to an end with a spectacular fireworks display. More than 100,000 fireworks exploded over the city in a 45-minute display, to the sound of live orchestral music. Matthew Halls led the Scottish Chamber Orchestra and Chorus in a performance of some of Handel's most popular works. Festival director Jonathan Mills said 2009 had been a "wonderful" year for the festival. An estimated 220,000 people were gathered in Princes Street Gardens, Inverleith Park, Calton Hill, on Waverley Bridge and elsewhere in the city to watch the display. What better way could there be to celebrate the festival? Fireworks cascaded down the sides of Edinburgh Castle as excerpts from Music for the Royal Fireworks were played before the concert came to a climax with the Hallelujah Chorus as gold and silver fireworks spiralled above the castle. Mr Mills said: "What better way could there be to celebrate the festival? "The Bank of Scotland Fireworks Concert was a masterful mix of choreographed fireworks and uplifting music performed with consummate skill by the Scottish Chamber Orchestra and Chorus. "I would like to thank all our artists and audiences for a wonderful 2009 Edinburgh International Festival." The festival season brings thousands of visitors to Scotland's capital each August and September. Organisers have reported a drop in international visitors this year but said it had been offset by a marked increase in UK audiences. The Fringe, book and art festivals have all reported an increase in visitor numbers or ticket sales.